easily and with complete accuracy! ... is a dependable reference source for essential literature used in Alcoholics Anonymous. This book facilitates a definitive understanding of fundamental AA literature. Every sentence in the Big Book (pp.1-164) and the 12&12 is indexed alphabetically. Simply look up a familiar word to find the passage you seek. 164 and More goes beyond a simple concordance with lists of words and page numbers. Your word is shown within the context of the sentence(s) in which it is used. The context allows you to select the exact passage you want. You save time and effort, particularly for words which occur often like fear and God. Use 164andMore.com to search the Big Book and the 12&12. Type the first few characters of your word-of-interest into the search box in the upper right corner. As you type, words are displayed which match your keystrokes. The more you type, the more precise the results. Simply click on a word and all references in the Big Book and the 12&12 appear! 164 and More is offered as a book; carry this powerful tool and locate passages in seconds. The book is ideal for sessions with your sponsor or sponsees, as well as Big Book and 12&12 study groups. 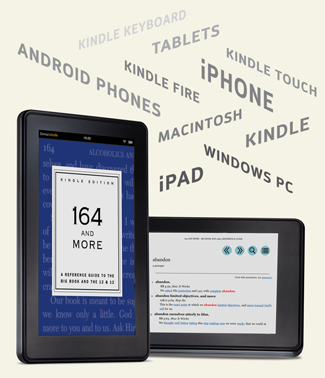 164 and More can help you locate passages from the AA literature that keep you on the path. Why not order a copy or two for use by your home group? It is our personal experience that there is great wisdom and magic within the pages of the AA literature. When you come through the doors of AA, it is suggested that you purchase a Big Book. The purpose of the Big Book is to show precisely how numerous alcoholics have recovered. Without embracing the literature, success in AA is difficult. 164 and More can help. We hope that 164 and More is useful, and strengthens your understanding of the AA literature. We wish you Godspeed with your journey in Alcoholics Anonymous.